Root veggies are in season right now. The produce department at my natural food store has three different kinds of beets, and their bin of squash is literally brimming with colorful winter varieties. What to make, what to make? As I followed my list through the store, Alicia, the assistant manager, came over to say hello. I met Alicia the first week the store opened and always enjoy seeing someone so enthusiastic, who obviously enjoys their job. I said that if she wanted a sweeter taste, she could always add a bit of agave. But molasses, she said, would be her choice. I seem to be hearing that a lot now-a-days. “I’d love to have a gluten-free bakery,” I said. (At least I think I would!) A place where I could serve up bread and muffins and cookies to people who have a hard time with wheat products, where they can find baked goods they can enjoy. Alicia thought a gluten-free bakery would be a great idea. She said she grew up in New York City and missed eating a bagel with a cup of coffee. 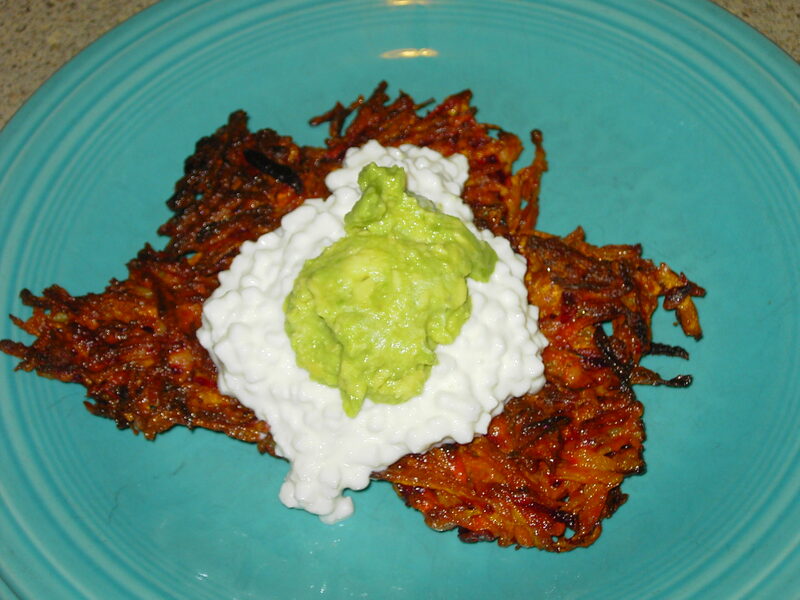 When she mentioned that she’d whipped up some beet and carrot latkes recently, my ears perked up. Now this, I thought, is doable. And in a few seconds she had spouted the recipe. It sounded quick and easy. Like I could make some that night. 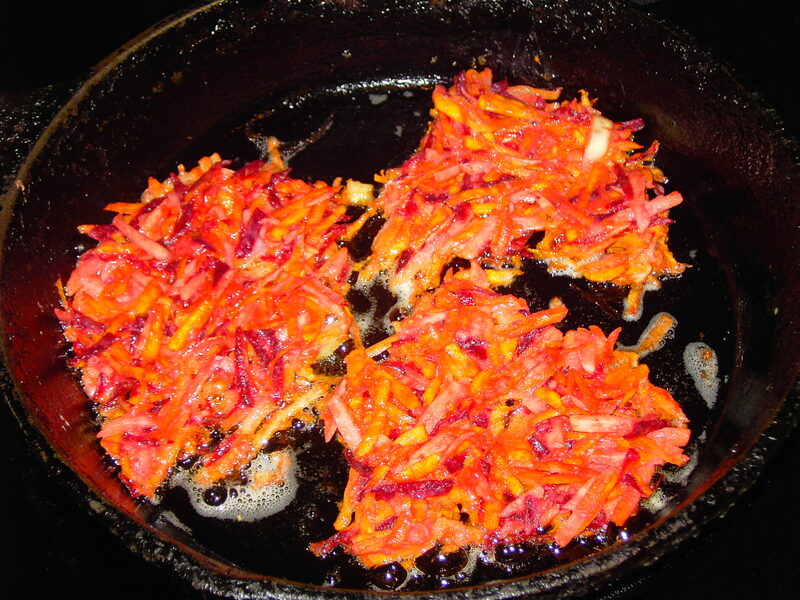 Frying the beet and carrot latkes. I broke out of line, ran to “produce,” and grabbed two beets – one red and one orange – from the loose beet bin. I had the rest of the ingredients at home. I also thought I would alter Alici’s recipe by adding two red potatoes to the mix. 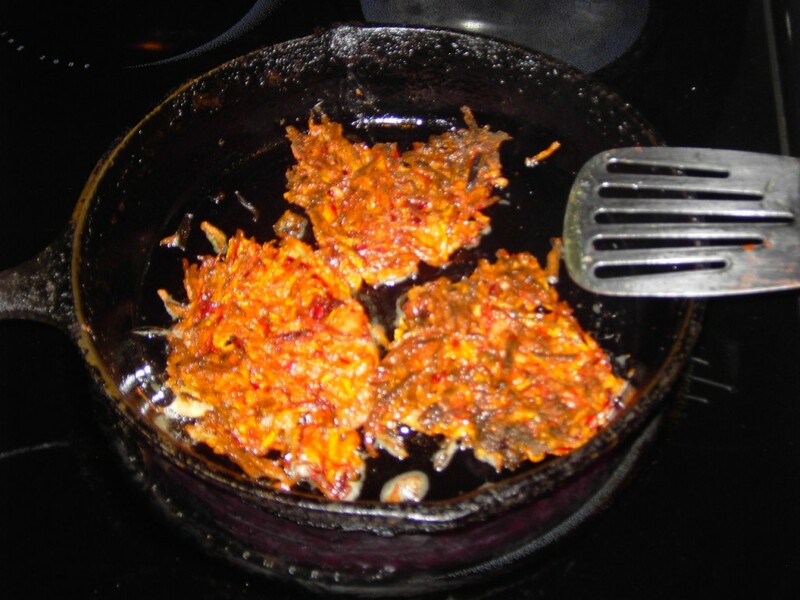 And that’s how I discovered Beet and Carrot Latkes. My husband had “fry-duty.” He let the oil get pretty hot before adding the batter, and watched them so they wouldn’t burn. Watch so they don’t burn. For toppings, we used low-fat cottage cheese; and a for a bright, fresh taste, added a dollop of simple, light guacamole. Make this with a mashed, ripe avocado, a squeeze of lemon and dash of sea salt.